I’m wary of dark crime fiction, preferring to read just a handful of authors I know I can trust, but Alex’s words of praise made me think I might have found another name to add to my list. 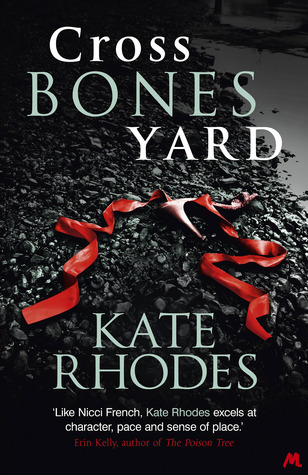 Now that I have read her first novel, ‘Crossbones Yard’, I can say that I have. There are many elements that are familiar in this book, but the quality of the writing was such that I didn’t mind. It made the characters, their worlds, their situations lived and breathed. And, as this is the first book in a series, and a first crime novel by the author, I see great potential for future books. The central character, Alice Quentin, is rather like so many other women at the centre of crime fiction series; highly capable in her professional life but rather less capable in her personal life. But she is much better drawn, much more credible, than most – if not all – of the others. She’s a psychologist, and she is clearly driven, she clearly works hard, and so she has done well. Particularly since she didn’t have the best of starts in life. Her father was abusive; he tyrannised his family. Now he has died, Alice’s relationship with her mother is strained, and her relationship with her mentally ill brother, who she desperately wants to help and support, is strained. She holds people at a distance, and her relationships with men tend to be short term; but she is a loyal friend. And at night she runs. Coping strategies maybe, but she was coping with life not just with her past. As we all do. The point I’m trying to make is that there was cause and effect, that there was depth, that the psychology rang true, and that Alice was a credible, believable character. Alice asked by the police to assess Maurice Cley – a known associate of Ray and Marie Benson, who had been convicted for murdering thirteen young women at the London hostel they ran – as he was due to be released from prison. Her assessment was that Maurice wasn’t likely to reoffend, but soon there was another murder bearing all of the Bensons’ trademarks – including some that had never been made public. And it became clear that Alice was at risk ….. The story had many familiar elements, and the Benson case was clearly inspired by the case of Fred and Rosemary West, but the story played out well enough. What brought it to life though, was Alice’s story. She ended one relationship and began another – with a policeman. She was putting up an actress friend. She was deeply concerned about her brother, who had parked his van nearby, and she feared that he might have seen things or done things. It was a wonderful human story, and it was clear that Kate Rhodes really understood her characters and difficult mental heath issues. The psychology was pitch perfect, and her view was clear and unflinching. And I see so much potential here for a series. Alice did, to some degree, place herself at risk. But I did understand that she wanted – needed – to keep running, to stick to her usual routine. And I realised, near the end, when she paid the price, that what she did that night she did in the heat of the moment, without thinking it through. She wouldn’t be the first, and she definitely wouldn’t be the last. That set up a dramatic conclusion. It felt inevitable, and I had identified the killer correctly, but it was the sort of book that made that not matter. I was caught up in Alice’s story, in an excellent psychological drama. And I must praise the writing – Kate Rhodes uses words very, very well, and she has the rare and wonderful gifts of being able to load a sentence with meaning and be subtle at the same time. That quality of writing, and fine creation and understanding of character and relationships, are more than good enough for me to want to keep reading her books. « A Musical Interlude: On the Eve of the Feast of Epiphany ….. I really enjoyed this book especially Kate Rhodes’ descriptions of London, I felt the setting came across really well. Her next book is waiting patiently in the TBR pile! Yes – the evocation of London was the thing I meant to mention and forgot. I’ll be ordering the second book from the library before too long I’m sure. Our libraries don’t have her books, unfortunately – and it looks like this one was just published in the US? If so, I won’t be able to get it via inter-library loan for a while. But an author to keep in mind (I usually avoid the darker thrillers too). Kate Rhodes doesn’t seem to have had too much of a promotional push here, and I hadn’t heard anything of her before I spotted Alex’s post. That might explain why it’s taking a little time for her books to make it over to you. I’d definitely say to you to look out for them, because her command of character and the quality of her writing is right up there. I’m always drawn to psychological suspense novels with interesting main characters (especially female characters). This novel hasn’t crossed my radar, but it looks like my library owns a copy and has her next one on-order. There are so many of these type of novels that beautifully written ones really stand out.